The MINI Cooper Countryman is known for having a comfortable ride and poised handling along the roads of Annapolis, Highland Beach, and Hillsmere Shores. However, it’s also known for having a great-looking interior that’s filled with tons of creature comforts. We’ll tell you about them in this MINI Countryman interior review. Discover everything that this vehicle has to offer and contact us at MINI of Annapolis if you have any questions. Heated seats are available, so you can stay warm on even the chilliest nights. Eight-way power-adjustable front seats with memory settings are available, as well. So, you can get in that perfect seating position and keep your settings saved, even if someone else takes your spot. This subcompact SUV has more than enough room for five passengers. In the front, you get 39.9 inches of headroom and 40.4 inches of legroom. In the back, there are 37.5 inches of headroom and 37.6 inches of legroom. The Countryman also has plenty of cargo room for grocery bags, luggage, and other items, with 17.6 cubic feet of trunk space. With the standard split-folding rear seats, you can add more items while still leaving room for a backseat passenger. If you want to maximize cargo room, then fold down the entire back row for 47.6 cubic feet of space. Plus, accessing the cargo area is easy, with the available power tailgate. Simply have your keys in your purse or pocket and swipe your foot under the rear bumper. The liftgate will then automatically open, and you can start loading items into the SUV right away. 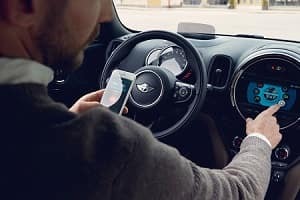 The design of the MINI Countryman will leave you feeling nice and comfy, and its technologies will keep you connected and entertained. It comes standard with a MINI Connected infotainment system that has a 6.5-inch display screen, Bluetooth® technology, and Siri® Eyes Free. This way, you can easily play music or make phone calls using just the sound of your voice. Apple CarPlay™ smartphone integration is available, as well. Just plug your phone into the vehicle’s USB port, and your favorite apps will appear on the 8.8-inch touchscreen. So, whether you want to listen to your favorite podcasts or send a quick text message, you can do so without messing around with your smartphone. Furthermore, you can utilize the available navigation system, with real-time traffic updates to help you get to your destination in no time. Also, the Active Driving Assistant will help you get there safely, as it comes with Forward Collision Warning and Automatic Emergency Braking. 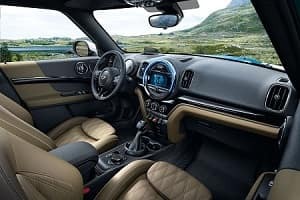 With a stylish interior along with lots of space and features, the MINI Countryman is a great option for your commutes around Annapolis, Highland Beach, and Hillsmere Shores. If you’d like to check the vehicle out for yourself, then don’t wait. 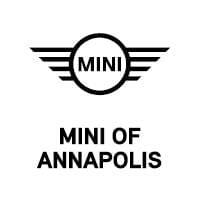 Schedule a test drive at MINI of Annapolis today!